An assortment of pictures from the trip, that didn’t make it into the post about the trip. Some are just too good not to share! You can scroll through them with the tiny arrows under the picture. You click on any one to make it bigger and start a slideshow. Hit the ESC key at any time to back up. Like all ocean crossings (I know – it’s only 54 miles from FL to the Bahamas, but it’s still an ocean crossing! ), we spent a good bit of time planning this one. Weather and sea condition forecasts, fuel planning, provisions, and the hundred other details that must be considered for an eleven day trip. But this one was actually in the planning stages for over five years! Because this trip was going to be the first time that all three of the original dreamers got to go somewhere on a big boat together. It was at least five years ago, in the warm comfort of our living room in Indianapolis, drinking good homebrew, that Fran, me, and our dear friend and neighbor Steve Powers started dreaming about traveling the sea on a trawler. Steve actually introduced us to trawlers – we literally didn’t know what one was until he brought over a couple issues of Passagemaker Magazine. We immediately took to the idea of a big, slow, comfortable, “apartment on a barge” kind of boat on which we could explore the Bahamas and Caribbean for a good, long time. The three of us looked at boats, and destinations, and dreamed of the day we could be living those magazine articles. TrawlerFest became something to eagerly look forward to. Steve and his wife Challen went to one in Baltimore and returned with a bag o’ goodies that fueled our conversations and imaginations for weeks. Then Fran and I went to one in FL and brought back more dream fodder. Then we’d start looking at the calendar to find the next one that one of us could attend. 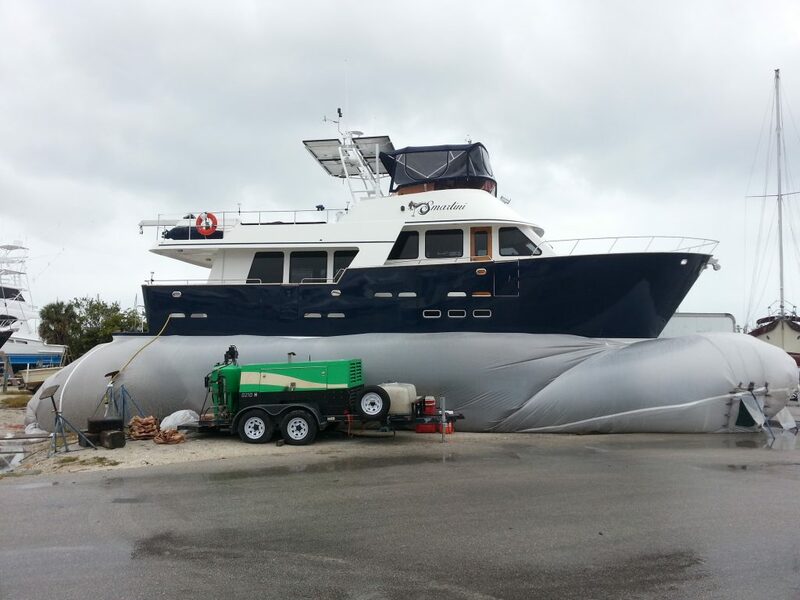 Turtle E. Awesome at anchor at Little Harbor, Abacos, May 2015. The short version of the ensuing 3+ years is that we threw our money together, bought the Practice Boat, named it Turtle E. Awesome, and it did, and still does, live up to its name. 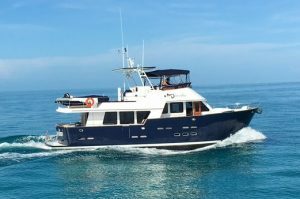 Fran and I took it to the Bahamas three times, decided we were going all-in on the trawler thing, bought Smartini, and sold our half of Turtle E. Awesome to Steve and Challen. But here it was, at least five years after the seeds were originally sown, and Steve and Challen had still not been able to be on a boat they owned, crossing an ocean to a tropical island. That was all about to change with this trip, and Fran and I were at least as excited for Steve and Challen – especially Steve – as we were about taking Smartini on an ocean voyage for the first time. We had plenty of time for the trip: the Powers (Steve, Challen, Brady and their youngest, Bennett – yes, they have a son named Bennett, too – he and my son Bennett are best buddies) would leave Melbourne, FL on the Turtle on December 17 and didn’t have to be back in Melbourne until January 1 for their flight back to Indy. Factoring in the cruise south on the ICW to Lake Worth, both crossings, and the cruise back north to Melbourne, we’d have nine full days in the Bahamas. Assuming we could do the crossings on the days we wanted to, of course. But at any time of year, especially winter, you can’t rely on good weather (hence good sea conditions) for the crossings. We were fully prepared to wait two or three days on each end of the trip for a decent weather window. 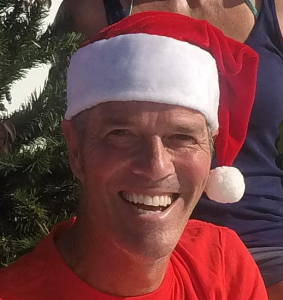 But I think Santa Claus, Mother Nature, and Poseidon must have gotten together and decided that Steve had been a good boy all year, and that he had waited long enough, so they told Boreas (Greek god of the North Wind) to take a few days off. We were able to cross over on the first day of our weather window (and later, to cross back on our last), giving us the maximum amount of island time for the adventure. We staged in North Lake Worth, a nice, big, calm anchorage a few miles north of the Lake Worth Inlet, the night of December 18. Steve served us all jambalaya on the Turtle, we checked every weather source for the thirty-seventh time that day, and made plans to pull anchor before sunrise and be leaving the inlet as BOB (the Big Orange Ball) poked his nose over the Eastern horizon. Fran and I slept well on Smartini, but I’m guessing Steve’s sleep was like that of a six year old on Christmas Eve, every fiber of his being tingling with anticipation for what the morning would bring. 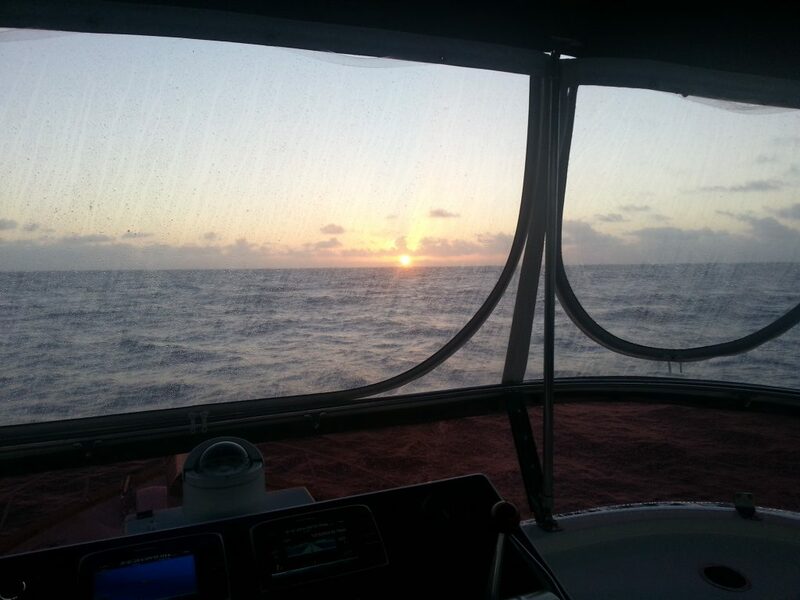 6:00 a.m. alarm, make coffee, check everything one last time, pull anchor, head for the inlet. Make the turn around Peanut Island, head for the middle of the inlet, and cross fingers and toes that all our preparations would be adequate, and that Boreas had, in fact, taken the day off. At the mouth of the inlet, the waves are way bigger and closer together, than had been forecast. Damn! But wait – it’s always worse at the inlet with wind from the East, as the waves and swell pile up in the relatively shallow water – don’t panic. There’s BOB, lighting our way – no, just piercing our retinas, making it almost impossible to see in front of us. “Turtle E. Awesome, Turtle E. Awesome, this is Smartini – how you guys doing back there?” “Turtle E. Awesome, doing fine!” It’s official – we’re heading to the Bahamas. It was lumpy / bouncy / sporty / snotty / <fill in your favorite term for a little uncomfortable on the water> for thirty minutes or so, and then settled into about what the forecast had been: 2 foot waves on a 5-6 second period. (The period is how often the peaks of the waves come – the shorter the period, the bumpier it is. 2 foot waves every 3 seconds is way, way worse than 4 foot waves every 10 seconds.) We all concluded it was doable for the 7 hours we had in front of us, but we’d be glad when we were in the marina at Old Bahama Bay. Throughout the day, as the wind would change a little in direction and intensity, it would get slightly better or slightly worse, but it ended up being pretty consistent. Both Smartini and the Turtle are very happy cruising at 7 to 8 knots (a knot is 15% more than a land-based mile per hour), and fuel economy is always better when slower, so we settled in at about 7.5, and watched the miles and the minutes churn away under our hulls. Good news: Smartini’s stabilizer system, which is supposed to significantly reduce rolling (the side to side motion of a boat), works! Although the waves were mostly on our nose all day, there was enough of a side component to set up some noticeable rolling – just ask the crew of the Turtle. But with the stabilizers on, we experienced almost none of it. Later in the trip, when we had bigger seas, from behind us at an angle – the real test of a stabilizer system – it performed as expected. Yay!! 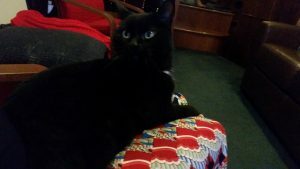 There was one member of the crew who didn’t have such a great crossing – May the Boat Kitty. Seven hours of non-stop pitching (and a little rolling) left her green around the gills. She didn’t hurl, but we’re guessing she felt like it, from the look on her little black furry face. The good news is, that was the last time she seemed to have that happen, including on the crossing back to Florida, which was about the same in the seasickness-inducing department. She’s a real boat kitty now. 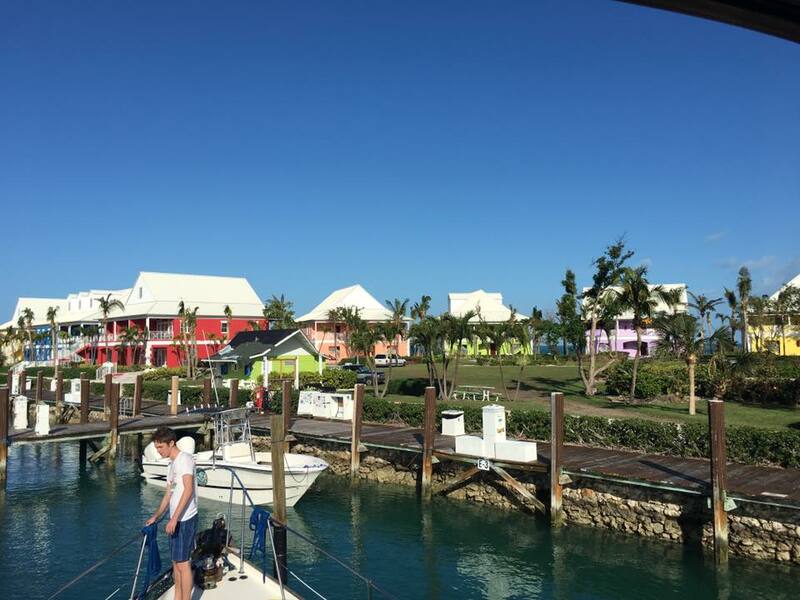 We pulled into Old Bahama Bay Marina, at West End, which is the settlement on the very west end of Grand Bahama Island, where Freeport is. There’s not much at Old Bahama Bay except the marina, but it was exactly what we wanted at the end of a long day of bumping across the Atlantic. It’s a great marina, protected on all sides from waves, tides, and even wind for the most part. That day (December 19) was literally their first day open since Hurricane Matthew. They had suffered a lot of damage, but fortunately, none of it major. The docks were all in perfect shape, but there was no power to them yet. The restaurant was open and served us a delicious dinner that evening, and their beach can be fun for a day or so – but there’s really not much to do from that spot. So we decided, since we still had nine days before we had to get back, that we’d keep heading East to the heart of the Abacos – Green Turtle, Great Guana, and Hopetown, planning to be in the Lighthouse Marina for Christmas. It’s seven or eight hours from Lake Worth to West End, but still another fourteen hours to Green Turtle Cay. (Throughout this story, when you see “cay”, say “key”. After only a dozen years or so, it may become habit.) There’s a really cool island, Great Sale, about halfway there, with excellent anchoring. 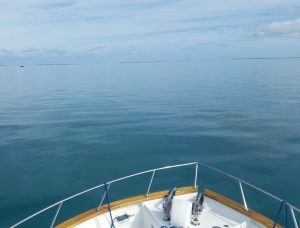 After a good night’s sleep at Old Bahama Bay, we set our course for Great Sale, and motored across the Little Bahama Bank on almost flat calm water, with full sun and just enough breeze to keep us from sweating. We reached Great Sale, tried unsuccessfully to find the blue hole that’s supposed to be on the south end of the island, then moved into the huge anchorage on the west side for a good night’s rest. The next day, from Great Sale to Green Turtle, was the same, only calmer. We saw a turtle or two, a single dolphin, and a few sea birds. But this part of the trip – aside from the beautiful turquoise water stretching to the horizon in every direction for much of the day – is actually kind of boring. If you’ve ever been on a cruise ship, it was like the days on the itinerary called “At sea” – but without the buffet. The Little Bahama Bank is a huge area in the northwest Bahamas with very few islands, and a typical depth of less than ten feet, with lots of areas where it’s less than five feet. See the picture. (By the way, the dark blue surrounding the Bank is a few thousand fee deep!) So although it feels like you’re in the middle of the ocean because you can’t see land anywhere, you better stay on one of the charted courses across the Bank, or risk running aground. It’s virtually all sand – that’s what gives it that color, but it’s also what makes it kind of boring. A flat sandy bottom doesn’t typically attract much sea life, and that’s very much the case on the Bank. 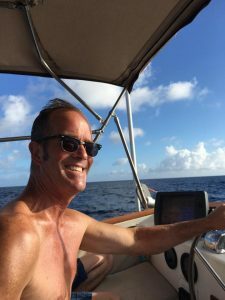 So you turn on the autopilot, pick an XM Radio station you like, and just enjoy being on the water. Surprisingly, it can kick up and be quite uncomfortable, as Fran, Brady and I found on our very first trip across the Bank in the Turtle, almost two years ago – but not this time. It was like being on a lake. We pulled into the anchorage on the south side of Green Turtle Cay as the sun was getting low in the sky. 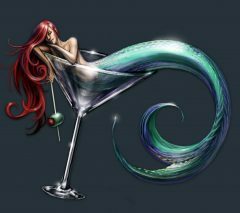 We maneuvered Smartini into a spot among the half dozen boats already anchored, dropped the hook – and thus began our intense dislike of the anchor that came with the boat. It’s a 66 pound Bruce anchor (aka “claw”). It’s way undersized for a boat as heavy as Smartini (83,000 lbs), and with its three rounded flukes, it won’t set in a grassy bottom, no matter how much you swear at it. Brady dove on it (only about nine feet deep, thankfully), managed to get it into a small sandy area, and finally, we were hung. And not for the last time did we wish we had gotten our new anchor before leaving on this trip. Meanwhile, the Turtle dropped its properly sized CQR anchor, and they were hung like the stockings by the chimney with care. 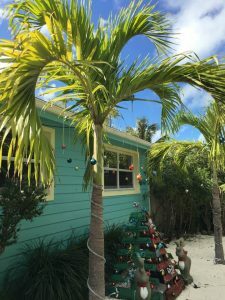 Christmas ornaments on a palm tree – why not? We decided to go ashore, explore the little settlement of New Plymouth, and find somewhere for dinner. It was a bit odd seeing Christmas decorations in this tropical locale, especially the snowmen – but why not? We had a very fine dinner at The Wrecking Tree, took the dinghies back to our floating homes, and made plans for the next day’s adventure – Around the Whale! 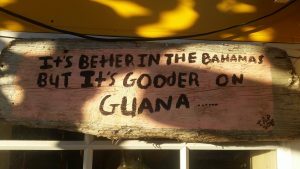 Look at the picture above of the Little Bahama Bank. 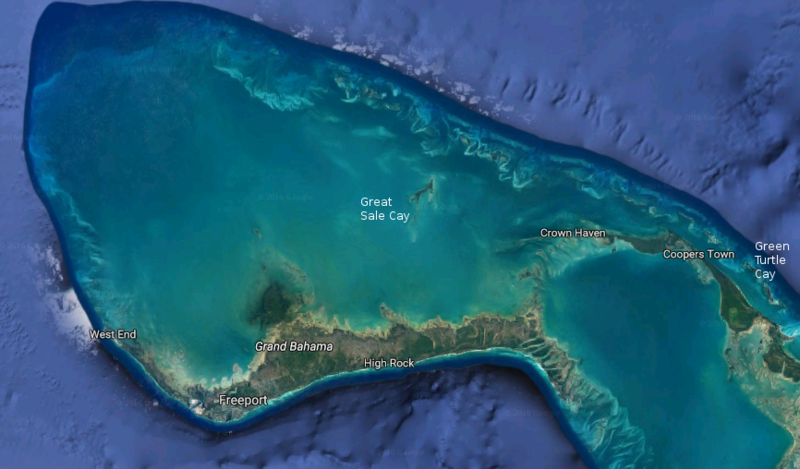 On the right edge, just southeast of Green Turtle Cay, you’ll see a small spot of turquoise. That’s the spot where the entire width of the Sea of Abaco is no more than about three feet deep at low tide, about five feet at high tide, but only in a few spots. The Turtle has been across that area four times on two previous trips – always at mid to high tide, and usually with slightly tightened sphincters as we passed the shallowest point, near Don’t Rock. But the Turtle draws only 3 ½ feet. Smartini draws six, so there ain’t no way, no how, we’re getting across there. 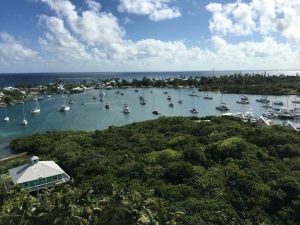 The only alternative is to go “around the Whale”, referring to the route around Whale Cay, which is plenty deep – and which can be plenty dangerous. Because on the outside of Whale Cay is the open ocean. With big waves coming from the Northeast, you can get what they call “rage seas”, as those big waves break over the barrier reef and start piling up in the much shallower water inside the reef. Not even very large yachts – 100 feet and more – will go around the Whale when that’s happening. We had told the crew of the Turtle that we might not be able to make it past Green Turtle, and they’d have to go on to Hopetown without us. But for the second time on this adventure, conditions were conducive to a safe, even comfortable, ocean journey (albeit one of only about three miles in total), and around the Whale we went! 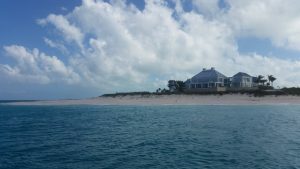 At the end of the Whale Cay passage is the northwest tip of Great Guana Cay, a seven mile long island with a lot going on. Just off that tip is a gorgeous beach, some shallow coral reef, and a little farther out, the actual barrier reef. On that day, the barrier reef was almost totally flattening the four to five foot seas that were crashing into it, making the inner reef nice and calm. It’s a dive site we named Sweet House on a previous Abacos trip with my longtime business partner Joel Kozikowski and his boat, eSea Street. We had decided, with the Turtle crew, that if the conditions were good, we’d meet there, anchor, and see if we could shoot some dinner – with lobster, grouper, and hogfish all in season. We anchored in sand in about eighteen feet of water, radio’d the Turtle to come join us (they had taken the inside passage past the Whale), and got out the snorkel gear. This picture was not taken on this trip. 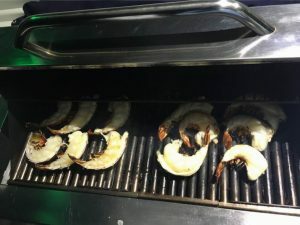 I’d love to tell you that we shot a Nassau grouper perfectly sized to make fish tacos for six, along with six lobsters. But I’d be lying. 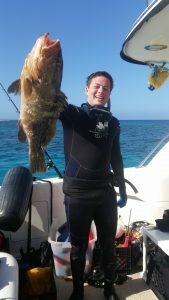 The truth is, we saw a lot of groupers, but didn’t have the skills to skewer any of them, and we saw no lobsters nor hogfish. But the snorkeling was excellent, Steve and Bennett got their first taste of real Bahamas coral reef, and we had plenty of dinner fare in the freezer, so no one was disappointed. We motored down to Fisher’s Bay, dropped the hook, and all piled in the Turtle’s dinghy to Grabber’s Sunset Grill for cocktails and a beautiful Bahamian (not Bohemian, Brady!) sunset. Great Guana is about seven miles long and runs NW to SE. It’s the first island in the Sea of Abaco after Whale Cay, so represents one end of Smartini’s no-worries cruising area in the Abacos. (Little Harbor is the other end.) It’s home to world famous Nipper’s Bar, Grabber’s Sunset Bar, Dive Guana, Orchid Bay Marina, the very hoity-toity Baker’s Bay Resort (did you really need to build a freakin’ golf course?!?! ), an assortment of other small businesses, and a lot of homes, most of which are apparently rentals. 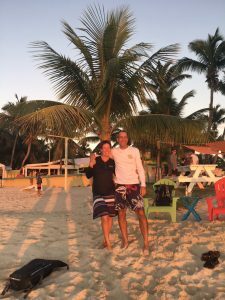 On its NW tip is the aforementioned Sweet House dive site, off its SE tip is a beautiful and protected (i.e., “no take zone”), dive area called the Fowl Cays (where our adopted niece Katie Stanhouse officially became a scuba diver in 2015! ), and on the SW side, just off Grabber’s beach, is one of our favorite anchorages in the Abacos, Fisher’s Bay. It’s protected from the prevailing winds, it’s deep enough for Smartini to anchor at low tide, it’s a short dinghy ride to Grabber’s beach, and there are lobsters there! With all that going on, and Hopetown less than two hours away, we decided to anchor here for two nights, so we could spend an entire day exploring. The Turtle crew dinghied in to explore the island and found some of the amazing Bahamian bread that is, all by itself, enough to get me to visit the Abacos again. After they returned, the menfolk on the Turtle started hunting for dinner among the small rocks and ledges near the anchorage. Fairly shortly, word came that they’d located some, but weren’t sure if they were of legal size, and not sure how to get them out of the rocks. 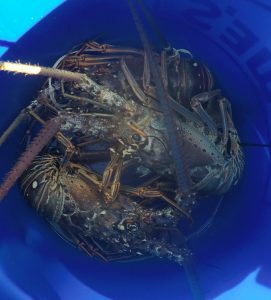 It didn’t take me long to drop what I was doing and suit up, and in short order we had six of them in the bucket – fresh lobster for dinner! We were never more than a few hundred feet from where we were anchored, right there in Fisher’s Bay. We spent the rest of the day just putzing around the island, and ended it with cocktails at Grabber’s, watching one of their gorgeous sunsets. We left Fisher’s Bay about 9:00 a.m. for the two hour run to Hopetown. We wanted to get to the Lighthouse Marina before 11:00, thinking they closed then (they didn’t), and hoping they had slips available (they did). In fact, the marina was empty when we arrived, and we were the only two boats in it the whole day and night. Paul, the very nice dockmaster there, welcomed us back (the Turtle had been there a few nights on each of our previous Abacos trips) and directed Smartini into the only slip they have that’s deep enough to accommodate our 6 foot draft. A few minutes later, Steve pulled the Turtle into the slip opposite us. When we first got the Turtle, none of us had any big boat experience. (At 43′, and with twin diesel engines, the Turtle is definitely a “big boat” by our definition, since all previous boating had been on 20′ lake boats.) Fran, Brady, and I were able to get some experience pretty quickly, as we all lived where the boat was. But Steve’s time on it was extremely limited, so each time he came to Florida and took the helm, he was kinda back at Square One. Handling the boat in close quarters – in and out of the slip, with other boats only a few feet away – wasn’t something he had much opportunity to gain confidence at. But here he was, pulling the Turtle into the slip with wind from one direction, current from slightly another, and a very shallow spot just off his starboard stern to worry about, with total confidence and competence. For just a moment, I felt a great sense of pride for him, and then I realized that he was just doing what Fran, Brady, and I had done before him only because we’d had the opportunity. My feeling of pride gave way to a feeling of incredible happiness for him. He was, after all these years, finally seeing his dream come true: he had just captained his boat a hundred miles south on the ICW, then across the Atlantic Ocean to the Bahamas, then across the Little Bahama Bank and the Sea of Abaco, and was pulling it into a marina at the base of a hundred year old lighthouse, in a cozy little Bahamian settlement, with his family, on Christmas Eve. “You pretty happy, Steve?”, I asked from the dock. “Freakin’ ecstatic!” was his understated reply. 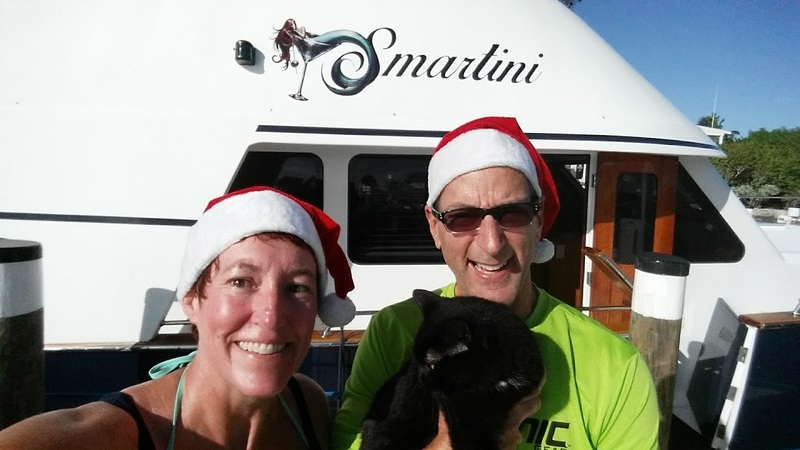 While Fran and I gave Smartini a top to bottom rinse, the Turtle crew dropped their dink in the water and headed across the harbor to town. (You can’t walk from the marina to town – you can only go by boat.) They returned a few hours later with some fresh bread from Vernon’s Bakery and keys to bikes they had rented. Meanwhile, Fran and I made new friends! I was on the upper deck, putting away the hose after rinsing Smartini, when a man stepped onto the dock looking for Paul to get fuel for his runabout. I noticed he was wearing a hat with the AOPA logo on it (Aircraft Owners and Pilots Association), so I said “What do you fly?”. He looked up at me, puzzled, but answered “A Baron, among other things.” We immediately started chatting about airplanes and flying, and were five minutes into the conversation when he said “The hat!”, realizing that’s how I knew he was a pilot. “You know, I’ve had this hat for probably ten years, and this is literally the first time I’ve ever worn it.” Not the first time that a seemingly insignificant decision sparked a conversation that led to a friendship (right, Richard and Beth? ), and a reminder to me to continue to engage new people. Especially if they’re boaters, or pilots, and absolutely without fail if they’re both. 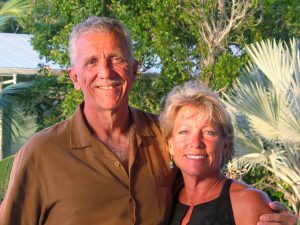 Mark and Diana are from Orlando, and have spent a week or two in Hopetown every year, often over Christmas, for the last dozen years. They fly the Baron into Marsh Harbour, rent a small boat and a house, and remind themselves what keeps bringing them back. We ended up spending a few hours with them, and with Steve and Challen, having cocktails at the Hopetown Inn’s poolside bar on Christmas afternoon. I could write several paragraphs about them just from that conversation, but I’ll summarize by saying these are people we want to hang out with some more! Having a Baron and not being afraid to use it will hopefully facilitate that. After we gave Mark and Diana a tour of Smartini, Fran and I put our dink in the water and putted over to Hopetown. As we were walking away from the dinghy, I heard “You’re Brian, right? And you’re Fran?”. What? Someone in Hopetown knew us? It was Caleb McDaniel, a fishing buddy of our dear friend Charlie Tudor, there with his family for the holidays. The next day, elsewhere in Hopetown, the same thing happened when his dad, Chris, saw us. Small world! We love Hopetown, and the whole island it’s on, Elbow Cay. It’s small, but has everything we’re looking for when vacationing. It’s got great history, which is apparent when walking around town. On one side is the ocean, and on the other side is the harbor, so it’s a water lover’s paradise. There are plenty of restaurants from bare bones to barbecue to elegant, and plenty of places to get a cocktail. And there’s Vernon’s Bakery and Grocery. Trust me, if you’re in Hopetown, you want to go to Vernon’s. He makes bread that’ll make the gluten-intolerant among you question your very existence. That evening, on the dock at Lighthouse Marina, we watched the Christmas classic, “Pirates of the Caribbean”. Steve and Brady projected it onto one of Steve’s Christmas presents, a high tech stretchy screen strung between the two tall antennas of the Turtle. 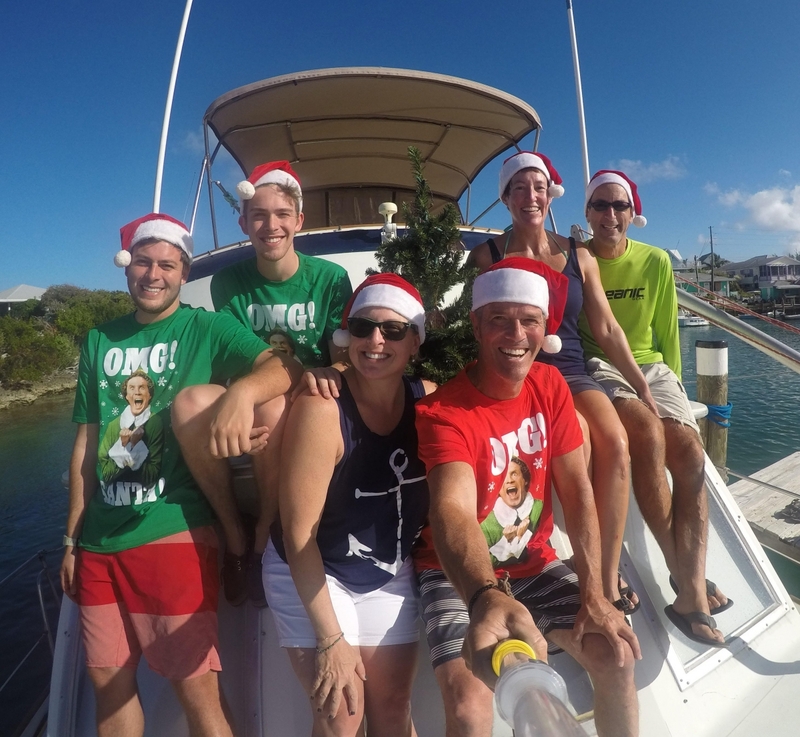 Over our left shoulders was the Hopetown Lighthouse, with strings of Christmas lights strung from the ground to the top, making the biggest Christmas tree in the Abacos. It was warm enough for shorts and t-shirts. You know – pretty much like any ol’ Christmas Eve in Indianapolis. 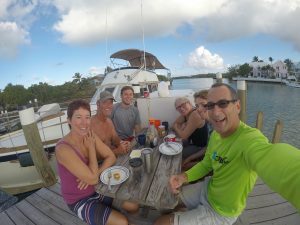 Christmas breakfast on the dock – Bahamian bread French toast! toast, on the dock, in brilliant sunshine and perfect temperatures. (I know I keep talking about Vernon’s bread, but if you’ve ever had it, you know why!) The only thing that would have made it a better Christmas morning for me would have been for Maddie and Bennett to be there with us. That’s one of the costs of this lifestyle Fran and I have chosen – being away from friends and family. I guess life is full of compromises, and always will be. After breakfast, we all rode bikes to the southern tip of Elbow Cay, stopping along the way for pictures by the ocean, and a cocktail at Sea Spray, a very nice restaurant / bar / marina on White Sound. We stopped the bikes at the gate that said “Private Property”, and walked on the beach, picking up shells, chunks of cool coral, and beach glass for Steve to take home to their lake house in Indiana. Brady and Bennett stayed with us for a bit, and then decided to push on to the very tip of the island, which happens to be one of the most beautiful stretches of sand I’ve ever seen, Tahiti Beach. After a grueling 18 minute bike ride back to Hopetown (hey – they have a hill! ), we returned to the boats to find Mark and Diana looking for us, wanting to go have cocktails at the Hopetown Inn. We don’t normally drink so early in the day, but it was Christmas, so what the heck! Over the next few hours, we learned that Mark was a fighter pilot, a flight instructor specializing in professional athletes and celebrities, and is now a top secret scientist for the NSA. Diana is the head of the animation studio at Disney. They have a talking pterodactyl named Sammy. At least, that’s how I remember the conversation. As I said earlier, we wanna hang out with those two some more! Christmas dinner was a buffet at Sea Spray, but rather than risk bikes in the dark, they sent their limo for us – a 6 seat golf cart. The driver was a nice man named Robert (I think). When we were going through the buffet line later, Robert was refreshing the pan of fried grouper and I said, “Robert, you’re a man of many talents – what exactly is your role here?” “Umm… I sign the checks”, he replied. We all thought it was pretty cool that the owner drove the golf cart, kept the buffet line full, and was also probably the chief cook and bottle washer. Dinner was excellent, although just a bit windy (we were outside under the coconut palm trees), and the ride back to Hopetown was uneventful. We had a different driver – I’m pretty sure he was just a regular customer of Robert’s who was happy to help out. You meet some nice people in the Bahamas. Day Eight Our third lucky weather and sea state let us go back around the Whale, giving us a better test of the stabilizers. We ended the day in a perfectly protected little cove on Munjack Cay, a favorite of our friends Beth and Richard, so we were a little sad we didn’t have to time to explore it. 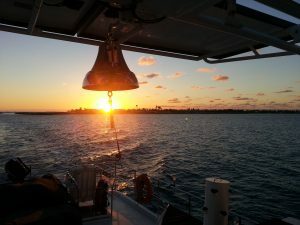 Day Nine Up before BOB, motor all the way to Mangrove Cay, anchor just before sunset. We did that long day so that our last day crossing the Bank would be short, and we’d have all afternoon at Old Bahama Bay. Day Ten Three hours to Old Bahama Bay, with a quick stop along the way on a textbook Bahamian coral head, where we were able to decimate the lionfish population. (But still no grouper.) All afternoon exploring the coastline and tide pools around Old Bahama Bay, and the absolute best octopus experience any of us may ever have. (That’ll be a separate post, with great pictures and video!) 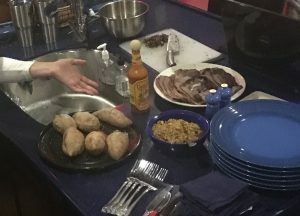 Smoked brisket dinner on Smartini that night – that Fran smoked while we were underway! Smoked brisket dinner – smoked onboard! Fran and I needed to get to Lake Worth to be hauled out for a new bottom job (that’s a whole other story that we’re in the middle of as I write this). The Turtle crew wanted to get as close to Melbourne as they could that day, so they were heading for the Fort Pierce Inlet. This meant we wouldn’t be crossing back together, but after this long, everyone was confident in their abilities on the water, and in their boat’s reliability. For the fourth and final time on this trip, we needed good weather and seas to get somewhere, and we got it – the forecast had only gotten better over the past three days. At 6:00 a.m on the 29th, the Turtle pulled out of Old Bahama Bay, followed an hour later by Smartini. 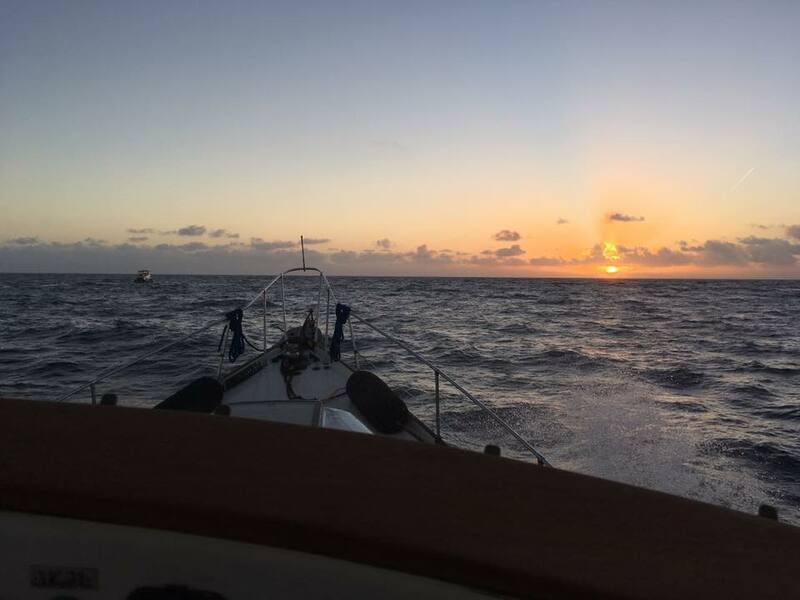 We were able to maintain radio contact until about 10:30, and both boats were within sight of land a few hours after that. Smartini pulled into the Riviera Beach City Marina by mid-afternoon, and Turtle E. Awesome, apparently eager for some night time navigation practice, motored into the ICW at Fort Pierce, then all the way home, pulling into their slip at Anchorage Yacht Basin about 10:00 p.m.
a) finally being converted to the hovercraft we always dreamed of. b) being fumigated, after a rat infestation was found in the bilge. c) being sandblasted below the waterline, in preparation for the second “10 year bottom job” in the last 11 months. If you have another guess, post it in the Comments.